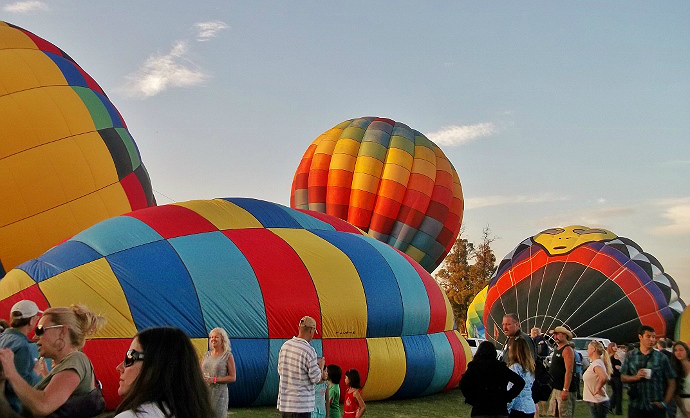 Momma Told Me: California Citrus Balloon + Wine Festival: Watch A Hot Air Balloon Go Up! 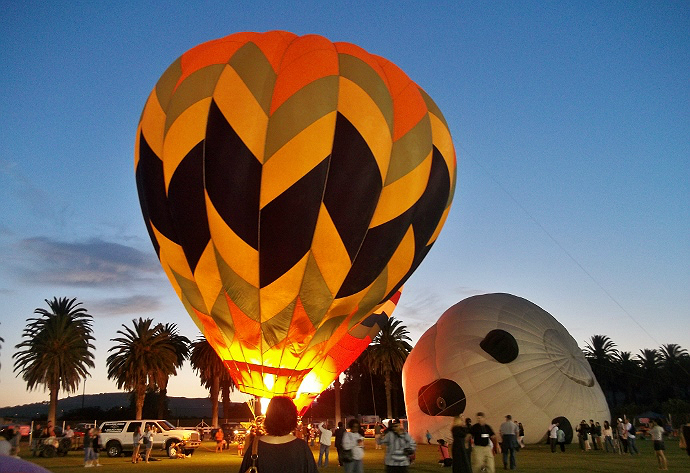 California Citrus Balloon + Wine Festival: Watch A Hot Air Balloon Go Up! Momma Told Me: Live life in color. Every since Dorothy stepped onto my television screen, first in black and white, with those glistening technicolor Ruby Slippers, and bravely boarded a magnificent hot air balloon in hopes of finding her way home, I've been fascinated. Living in Southern California I'm fortunate to get a glimpse of 1 or 2, every few years, floating past the mountains in the nearby valley. 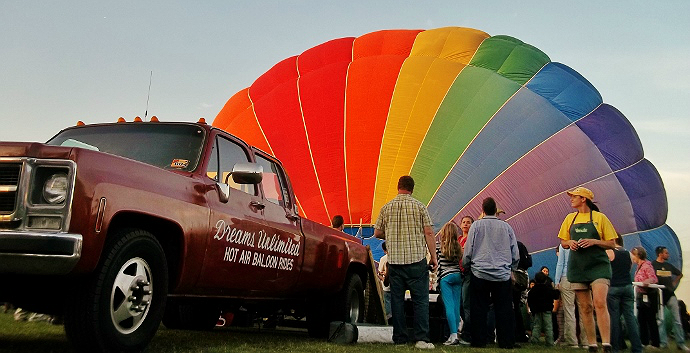 Hot air balloons are no cheap hobby, and, while readily available in my locale, a simple dream ride is not cheap. If you can get a deal on Groupon you might be able to book a minimum of 2 adults for $75 a piece for a one hour flight (something I've always considered well worth the cost). In fact, I hope to do this with my father someday, if I can catch the right deal. Luckily for me, 3 years back now, I discovered a rather big-to-do event in the nearby soccer field, adjacent to the town my ex-husband and I were living in. 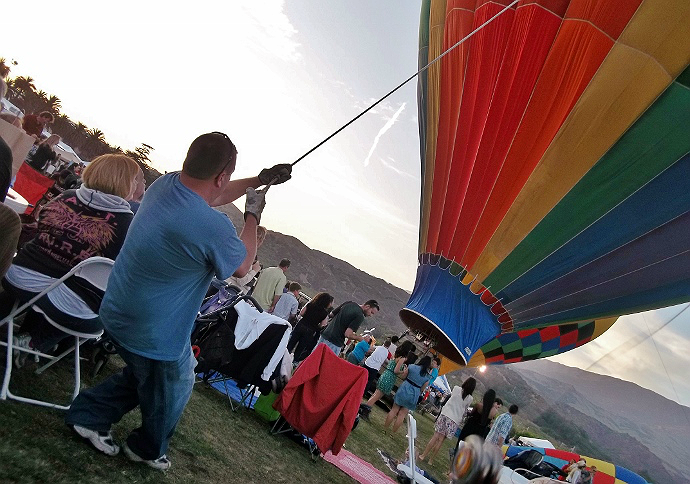 A Balloon (and Wine) Festival, which comes to town once a year for a special 3 day engagement of artisan beer and wine vendors, food, crafts, and fundraising tents. As it turns out, this is not something exclusive to my part of the country; many hot air balloon operators actually spend about 1/3 of their year traveling (some worldwide) to various events like this, where they can book weekend morning flights with eager customers, and pocket a little cash and advertising money for their time. You may recall me blogging about my first visit to this festival 3 years back in a Wordless Wednesday post; needless to say, my photography has improved immensely since then. It's really quite fascinating to watch as the baskets are loaded out of trucks and trailers, then gently tipped on their side as the large parachute like balloon is stretched before it. 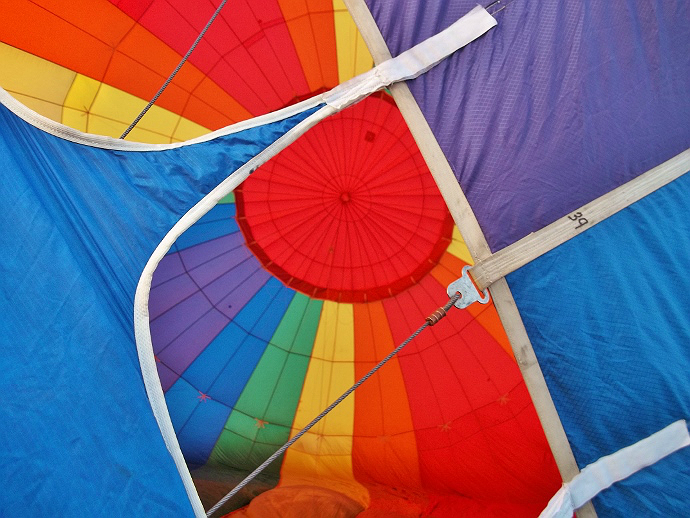 I was also surprised to see that the very top/end of the balloon is actually kept open for initial inflation, and only zipped shut once air has inflated the entire canvas to about 4' off the ground. (Also visible in the shots above). 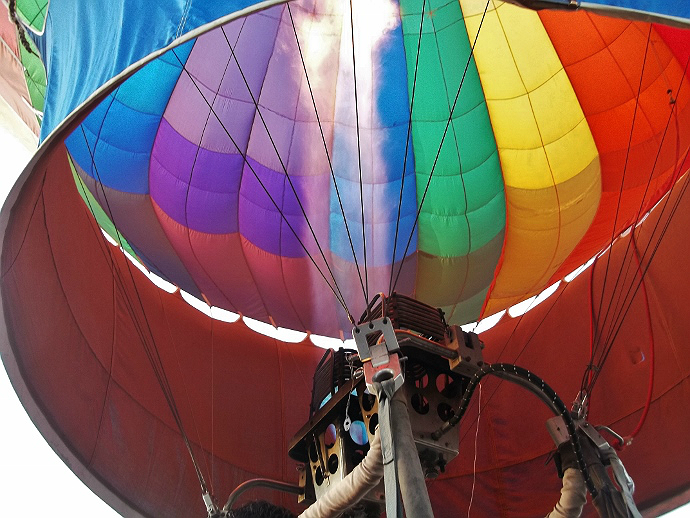 A very large fan is used to first ignite enough wind to billow the balloon, then the top is zipped to catch that air, and the flam is slowly used as the basket is tipped into an upright position. 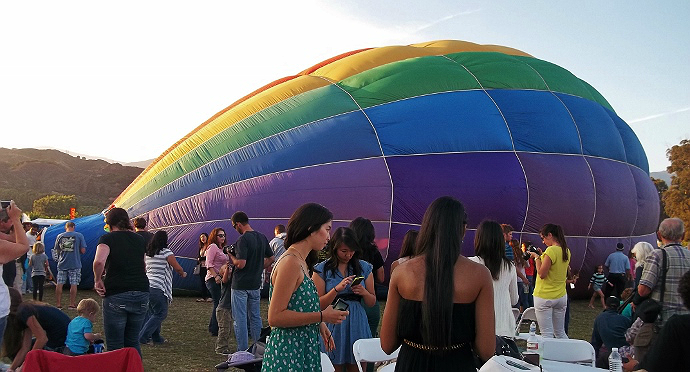 On this particular day it seemed quite calm on the ground, where us bystanders stood, but the 110ft tall rainbow balloon before us was certainly impacted by the winds up higher. There was a bit of struggle for a half hour, where may of the smaller balloons had to deflate entirely in hopes the winds would calm down. No matter how many times I see a hot air balloon in this setting I am consistently in awe of the sheer size and beauty. 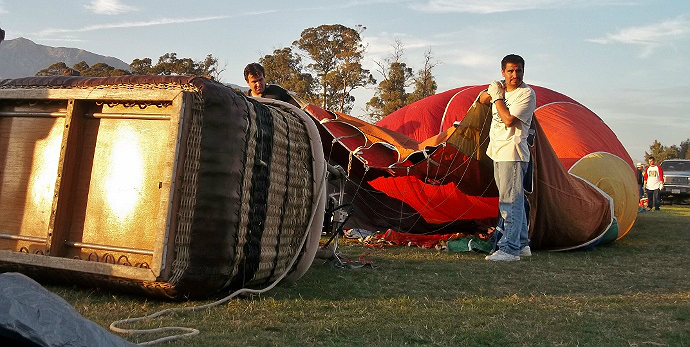 A single basket can fit 5-6 adults (which were much needed to weigh down the tipping balloon in the wind.) 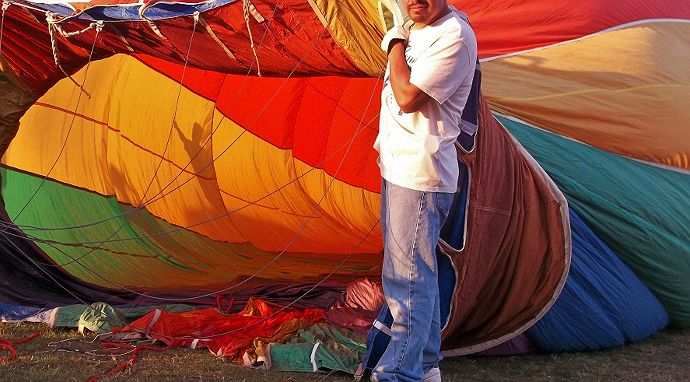 Many of the balloon vendors visiting are very accommodating with the eager visitors who want to touch the balloon as it inflates, get shots of it sideways, sit in the basket and feel the flames, and even take short 10' flights hovering above the ground (called a tethered ride, it's often customary to tip for such a privilege.) 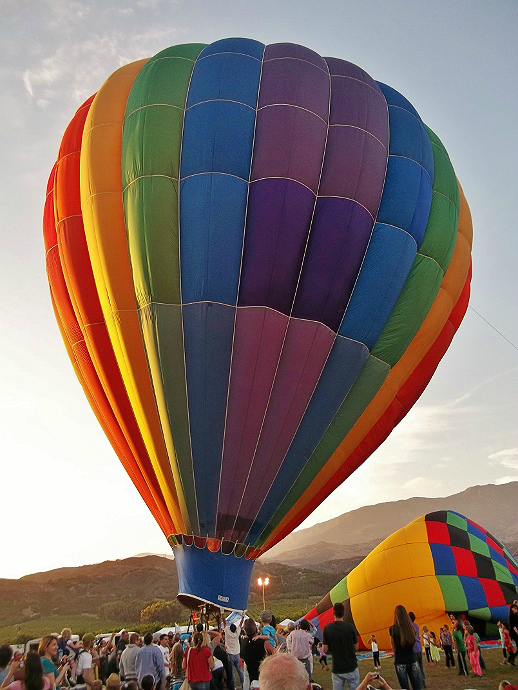 Just standing basket-side and feeling the roaring heat of the flame is quite exhilarating, I can only imagine it paired with the beauty of soaring above the valley! We spent 5 hours at the Citrus Balloon and Wine Festival, and participated in many fair-style activities, and even indulged in Garlic Fries (more pics to follow); but few things captivated both young and old as much as an up close look at these roaring beauties. The experience definitely transforms as you go into dusk, and then nightfall, it's hard to pick a favorite portion. Sabrina was captivated the entire time, as she kept asking if she could go 'touch' or 'look' at every aspect of the process. There was one little hiccup, with the challenge of the wind. The particular balloon we were watching go up, which happened to be the biggest and first, had recruited some audience members as anchors for the rope tether. 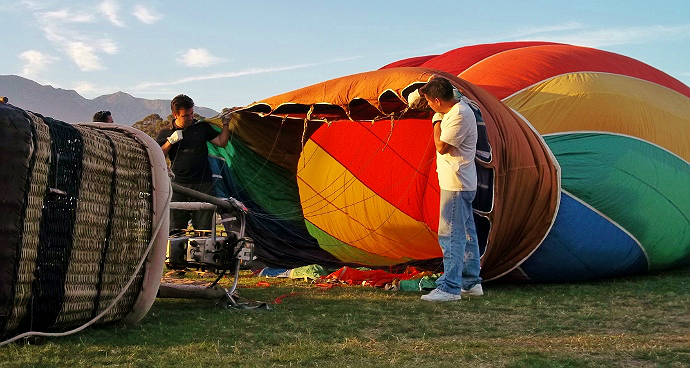 A giant rope is suspended from the top of the balloon to help dissuade swaying and rolling in the wind. The very first 'volunteer' was a rather well built man of good size, decked with some heavy duty burn-guard gloves. Of course that didn't protect him from nearly being carried away by a few gusts of wind. This giant balloon quite literally had him dragging through picnic sites, and his feet even left the ground a foot or two several times- talk about exciting! Thankfully nobody was injured during the nights festivities, and fun was had by all! 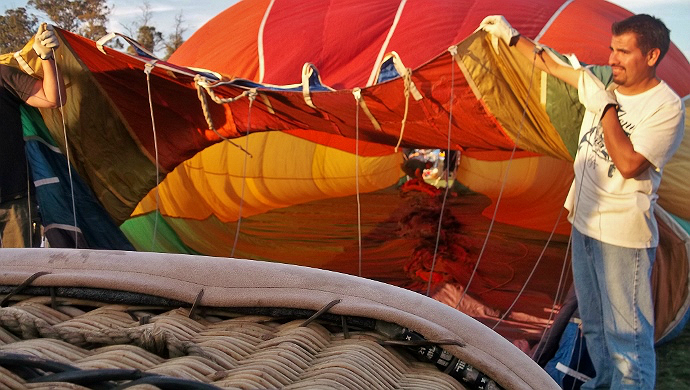 Look for a similar hot air balloon festival near you. What Daughter Says: With a little bit of research there can be some amazing once-in-a-life events found! We have lots of hot air ballooners in my area. I just love watching them from the highway when I'm driving to the city. Not sure I'd want to go up in one but they are pretty. This is utterly amazing and breathtaking...I would love to experience something like this!! We have a local balloon (no wine) festival but I am going to start suggesting that they add wine to the mix. We went to a small local balloon festival in my area. I would LOVE to go to a larger one. When they light up the balloons at night, it's just spectacular. Great photos, as always. Wow, that is absolutely amazing! 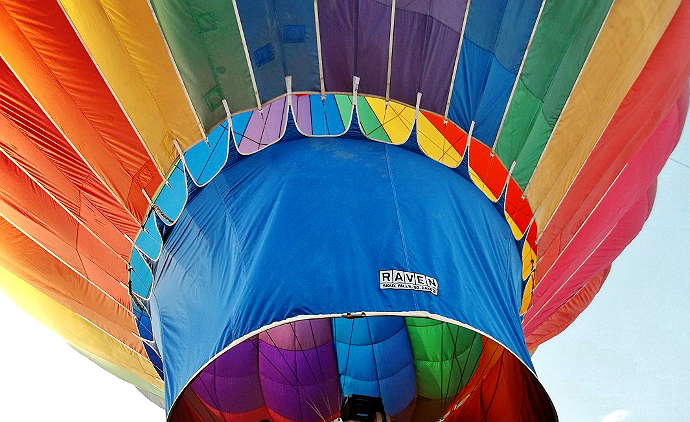 I would love to attend a balloon festival! Your pictures are stunning! Makes me want to ride in. One even more! There is an event every year right in the neighboring town call "Eyes to the Skies", which has an amazing display of hot air balloons. I really have to go some year! I know you have to be there at like 6 a.m. The kids are so young to wake up that early, but something we will be doing in the next year or two. 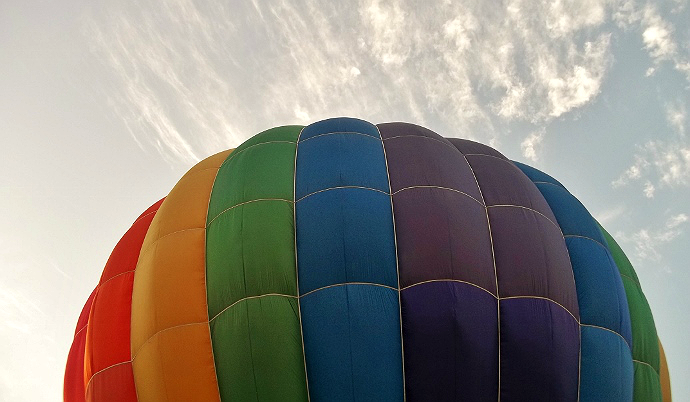 My husband proposed to me in a hot air balloon. I get excited everytime I see one for the good memories. I only wish I would have beautiful pictures like these!